What do pirates, ninjas, robots, zombies, aliens, wizards, tricksters, and dinosaurs have in common? They’re all trying to take over the world! But they can’t do it alone, so they’re teaming up. Every combo brings a different experience in this fast-paced shufflebuilding game. Take two 20-card decks, smash them together, and then rock your opponents’ faces! 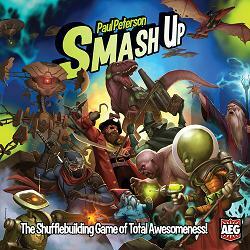 Is Smash Up a game you can live without? Not if you’re awesome. Choose a side. Choose two! And start the carnage! Dozens of deck combinations, making the replay value immensely high! Features 8 different factions, including dinosaurs with lasers!